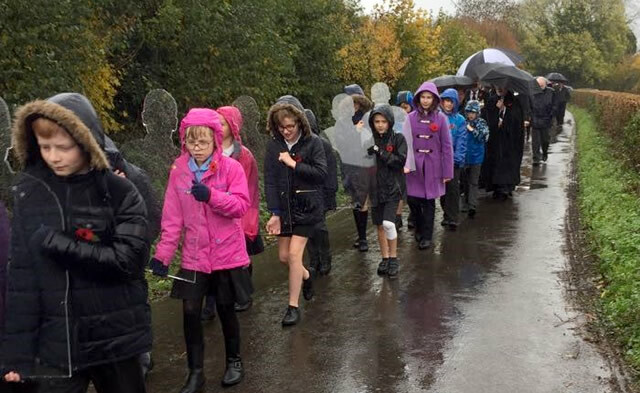 Children from Horsington Church Primary School processed 14 silhouettes, representing the 14 Horsington and South Cheriton soldiers lost to WW1, from Horsington War Memorial to St John’s Church on Friday 9th November. Led by British Legion standards and a twenty-strong contingent from the Army Air Corps, the Adjutant General’s Corp (SPS) and Veterans. 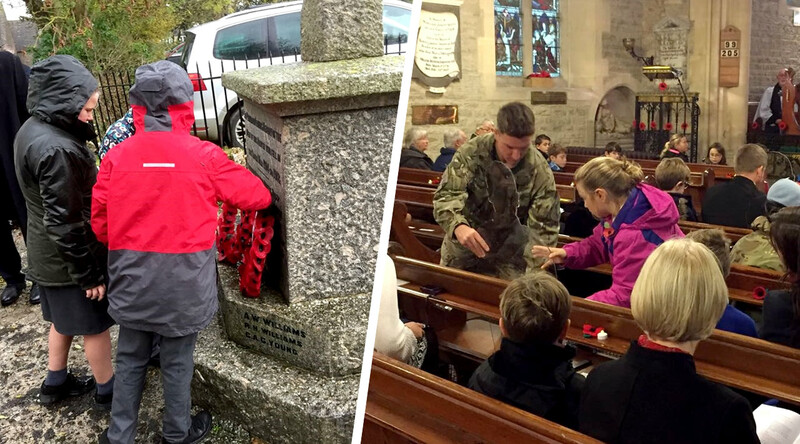 Heavy rain did not deter children from Earth class carrying their soldier’s silhouette from the Memorial to the Church, watched by the children from the rest of the school. Many people visited the school first to see the colourful ‘Hall of Remembrance’ in the school hall, to which every child in the school had contributed. With their hoods up and others under umbrellas against the heavy rain, the children formed a semi-circle in front of the Memorial with two children holding each silhouette. Revd. Ian Coomber led the short service there with the gathered congregation hearing the names of those who died in the war called out by each pair of children. Three of the children laid their wreaths on behalf of the School community. 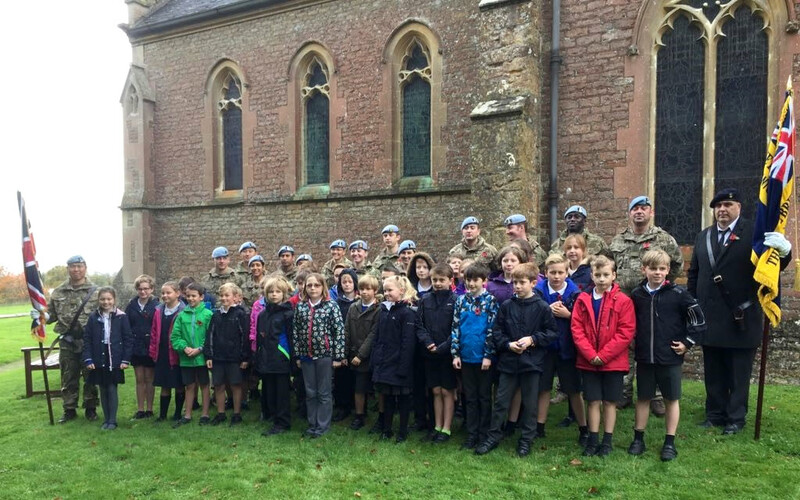 After two minutes' silence The Last Post was played and the children formed up behind the flags of the British Legion, the Union Jack and the contingent from the Army Air Corps who marched to the Church. At the beginning of the service in the Church the ‘colours’ were presented with the Union Jack placed on the Altar. Stephen Miles welcomed everyone to the service reminding us all of the aim of the commemoration, “to take the names from the Memorial and bring them back into the places they left behind”. Thanks were given to all those who had purchased silhouettes. During the service each silhouette, carried by one of the children and a soldier, was brought forward as their name, rank, service number, regiment, date of death and their age was announced. The congregation heard in which cemetery they were buried or which war memorial their name is on if their grave was unknown, where each had lived in Horsington or South Cheriton and of their families and occupations. With some there was poignant information on how they met their fate; some in France, Belgium, Iraq, Gallipoli and India. The children recited very movingly the words of In Flanders Fields which they had learnt by heart, and three children led the congregation in prayers at the end of the service. A retiring collection raised £250 for the charity ‘Remembered’ with money going to military charities supporting veterans. The event was inspired by the charity ‘Remembered’ and the 2018 Armistice project ‘There but not there’.